The science of Marma was shrouded in mystery for a long time, as it was taught only to certain people; to prevent its misuse. Marma science has many facets related to other sciences like martial art, Yoga etc. This is the first book which has put together all these aspects with marma points. Dr. David Frawley (vamadeva Shastri) is recognized both in India and the West for his knowledge of Vedic teachings, which include Ayurveda, Vedic Astrology, and yoga. He is the author of twently books published over the last twenty years, including Ayurveda and the Mind, Yoga of herbs, Ayurvedic Healing and Astrology of the Seers. His Vedic translations and historical studies on ancient India have received much acclaim, as have his journalistic works on modern India. Dr. Frawley is the director of the American Institute of Vedic Studies and is on the editorial board of the magazine Yoga International for which he is a frequent contributor. He is also the president of the American council of Vedic Astrology (ACVA). Dr. Subhash Randade, is one of the foremost eastern experts on Ayurveda. 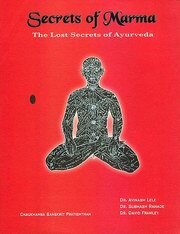 He is also the author of numerous books and teaches Ayurveda worldwide. He regularly visits Europe and America. These two experts bring together the best of East and West in explaining Ayurveda relative to current health and fitness needs. "very easy to understand due to flow charts and diagramatic representation"
"very easy to understand due to flow charts and diagramatic ..